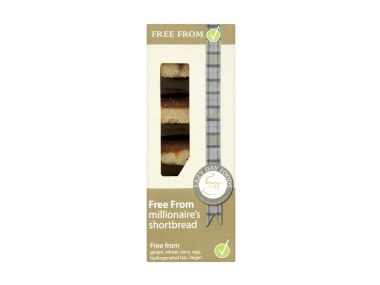 Buy Lazy Day gluten free, dairy free, egg free Millionaire's Shortbread in the UK from our online shop or directly from our independent Scottish store. Free from biscuits made in Scotland. Free from gluten, wheat, dairy, egg, hydrogenated fats. Vegan and Vegetarian. Millionaires Shortbread has a delicious shortbread base spread with a thick, smooth layer of golden caramel. Topping the biscuit off with a crisp layer of Belgian dark chocolate. FREE FROM: wheat, gluten, dairy, egg, hydrogenated fat. We sell real Lazy Day and other Gluten free Breads & Biscuits directly from our shop in Scotland and online throughout the UK. View more products from Lazy Day. Where can you buy real Millionaire's Shortbread safely online? If you are wondering where you can buy Lazy Day gluten free, dairy free, egg free Millionaire's Shortbread safely online in the UK, then shop with us. Millionaire's Shortbread - Lazy Day gluten free, dairy free, egg free Millionaire's Shortbread in Gluten free Breads & Biscuits and Biscuits & Breads.